Joshua has been involved with the crystal skulls since 1983 when he had an opportunity to be in the presence of an amethyst skull located in northern California known as "Ami". At that time, he felt a very strong connection with this artifact which forever changed his life. Since then, he has devoted a great deal of time and effort to sharing with others key information about the crystal skulls and the role they have to play in the prophesized "Golden Age". 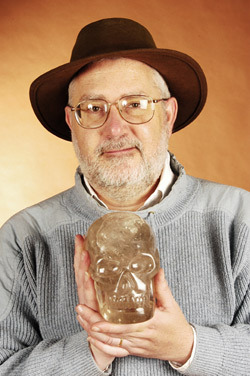 He feels very fortunate to have had an opportunity to be able to visit privately with a number of the more well known crystal skulls in the world including: the "Mitchell-Hedges Crystal Skull", "ET", the “British Museum Crystal Skull”, and “Ami”. about the crystal skulls - it is called "The Unfolding of the Crystal Skulls"
Our Newsletter: "The Unfolding ..."
In the picture shown above, we see Joshua holding his crystal skull known as, “Portal de Luz” (this is Portuguese and means “Portal of Light”). He has traveled with "him" (the skull) all over the world and "Portal" was carved in Brazil in 1998. "Portal" is one of nine crystal skulls that Joshua and Katrina actively work with. Joshua is the author of various books including a previous book about the crystal skulls entitled “Mysteries of the Crystal Skulls Revealed”, written jointly with Sandra Bowen and F. R. ‘Nick’ Nocerino. This other book was published in 1989 and there was a Portuguese edition issued in Brazil in 1993. The new book that they hope will be available at the end of this year (2010) or the early part of 2011 is also called “Journies of the Crystal Skull Explorers” written with the help of his partner, Katrina Head. This book has been published in a shortened form in Polish (2004), Dutch (2006) and Hungarian (2008) so far. He is also the co-founder of V J Enterprises, which is located in the Bloomington, IL area (U.S.). This organization has been in operation since February of 1992. V J Enterprises is dedicated to sharing the best information that describes how our planet will be transformed into a Golden Age by the year 2013. Joshua has also given a number of other public talks about UFOs and discusses as well, the controversial Bible Code, Crop Circles, Peru and now discussing some links between the crystal skulls and "Orbs". Finally, Joshua is involved with a feature film project to tell a special fictional story how the world could see world peace in the near future. He is continously following up leads and contacts to help to bring the proper resources so that one day soon this film will be shown in your local theater. If there is anyone who might have an interest to help please feel free to contact Joshua.